Five days until Christmas and I was thinking we would be baking up gingerbread houses, eliciting extra holiday cheer, and/or counting all the presents under the tree right about now. Unfortunately, we found ourselves in the doctor's office getting antibiotic breathing treatments and chest x-rays instead. Bunny on her nebulizer- she is one sick little darling. The Bunny has been diagnosed with pneumonia. I am freaking out one hundred percent. People in the Victorian era DIED of pneumonia! (at least that is what my sketchy memory of history tells me) And while my doctor reassures me she will be fine with the medication, having to watch to make sure she is breathing... it's driving me insane. I am not a nurse, people! Who thinks I should be the primary caregiver for a three year old with freaking pneumonia?! I am ready to push the red button and take her to the ER every time I hear a hint of wheezing. This is a job for professionals! I am the doofus who told my mom this morning that I'd call the doctor tomorrow if she didn't start getting better. Like she had a cold. Clearly, I should not be in charge of these things. Of course my Mom did the right thing and talked me into calling the doc. I think I even rolled my eyes and said "oh-kaaaay, mom" while thinking "I'm sure they'll just tell me it's another virus! Which is super frustrating after sitting in the 'sick waiting room' for three hours." But really, she's got a nasty cough, she's wheezing, her fever was careening out of control, she looks like a walking zombie, (the cutest zombie there ever was, though! Holla!) just sick as a dog. Anyway, freaking out, blah blah blah. Very sick Bunny. The Squirt is less sick, but still sick, so we're keeping an eye on her. ... and our super-fun Christmas is IN FIVE DAYS. (I was really psyched for this year! There will be bikes!) We have five days to cure pneumonia and make sure no one else in this house gets it! Graciously, my mother has volunteered to take Little Man for a stay at Chez Grandma for a couple days in a pneumonia free environment. I'm pretty sure she has no idea what she just signed up for. That's a LOT of baby time. Uninterrupted baby time. Let's all pray it goes well. Super cute addendum story? 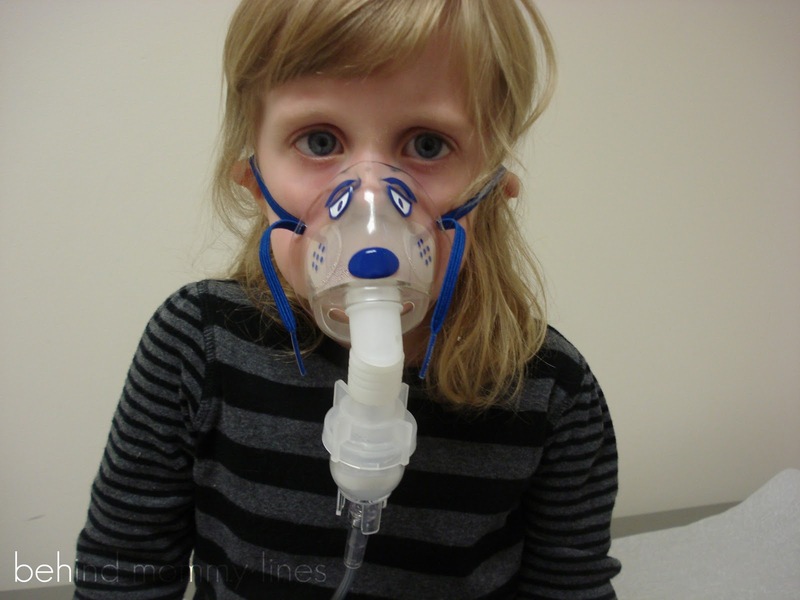 Bunny was quite scared of the nebulizer at the doctor's office. The nurse then asked her if she liked teddy bears or penguins. (Um, penguins- no question!) She returned with an adorable penguin nebulizer with a red bowtie and whose zipper case was made to look like an igloo. (nice touch! Totally unnecessary, but great!) The nurse said it was the last one and she'd been saving it for a special child. A special kid just like my Bunny. I'm pretty sure I'm going to try and take a picture of the penguin-y cuteness. To sum it all up? Worst. Day. Ever. Plus penguins. aw, you poor thing, and bunny too! jonni had pneumonia at 1 year, and erik had it at 18 months, so i totally get what you're going through. we did the nebulizer and the whole bit as well. the good news is that pneumonia ISN'T contagious (although the illness they had before that is, since pneumonia is a secondary bacterial infection, but once they get to the pneumonia stage, they are no longer contagious. i've got it right now, actually, lol! runs in the family i guess...), and the little ones bounce back astoundingly fast once they are on the breathing treatments. you'll probably get a pretty decent christmas after all. lots of hugs and prayers for you! Things will get better..kiddos are resiliant!! My nebulizer is so not cute like her's is!! !